In anticipation of our Workshop on Populism and Constitutionalism on 20 November (info & sign up here) we are publishing a series of blog posts in which the speakers will outline their thoughts on the topic. 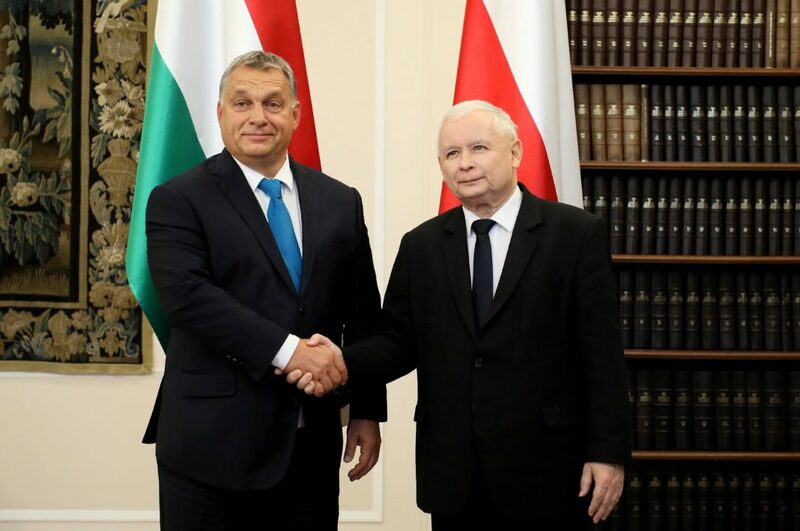 We are continuing our series with a contribution from Gábor Halmai, Professor of Comparative Constitutional Law at the EUI, who, reflecting on populist developments in East-Central Europe, questions whether populism and constitutionalism are reconcilable at all. See our previous posts here and here. This paper deals with recent deviations from the shared values of constitutionalism towards a kind of ‘populist, illiberal constitutionalism’ in East-Central Europe. The theoretical question these backslidings raise is whether populism and illiberalism are reconcilable with constitutionalism at all. Due to my focus on the region, I’ll concentrate on a particular version of populism, which is nationalist and illiberal, and is mainly characteristic of the countries of East-Central Europe, most of them being members of the European Union, a value community based on liberal democratic constitutionalism.1 This means that the statements about the East-Central European populist constitutionalism in this paper do not necessarily apply to other parts of Europe (Greece and Spain), Latin-America (Bolivia), or the US, where populism has a different character and its relationship to constitutionalism is also distinct from the one in Hungary or Poland. While populists readily attack the ‘establishment’ while in opposition, they strongly protect their own governmental institutions when in power. For instance, Viktor Orbán’s Fidesz party tried to undermine the legitimacy of representation: after losing the 2002 parliamentary elections, he refused to concede defeat, declaring that “the nation cannot be in opposition, only the government can be in opposition against its own people,” while after the 2010 electoral victory he claimed that through the “revolution at the voting booths” the majority had delegated its power to the government representing it. This means that the populist government tried to interpret the result of the elections, which made the people present as a unity. The Orbán government, having overthrown its predecessor as a result of a popular referendum in 2010, also made it more difficult to initiate a valid referendum. While the previous law required only 25 percent of the voters to cast a vote, the new law requires at least 50 percent of those eligible to vote to take part, otherwise the referendum is invalid.9 The ambivalence of populists towards representation and referendums in government and in opposition applies to their attitude regarding established institutions. While they readily attack the ‘establishment’ while in opposition, they strongly protect their own governmental institutions when in power. The situation is different with transnational institutions, like the EU, which are also attacked by populist governments as threats to their countries’ sovereignty. Paul Blokker understands popular constitutionalism as a form of constitutional critique and ‘counter-constitutionalism’, rather than an outright denial of liberal constitutionalism and the rule of law. Echoing Ernesto Laclau’s argument that the rise of populism is a consequence of the denigration of the masses11, Blokker also claims that the populist critique on liberal constitutionalism invokes relevant critical dimensions of the current democratic malaise, and populists claim to represent and give voice to the ‘pure’ people.12 According to Blokker, this critical stance towards liberal constitutionalism is related to a Schmittian understanding of the constitution, and to Carl Schmitt’s critique of liberal constitutionalism and its conception of the rule of law. As is well-known, the constitution is in Schmitt’s view an expression of ‘the substantial homogeneity of the identity and the will of the people’, and a guarantee of the state’s existence, and ultimately any constitutional arrangement is grounded in or originates from an arbitrary act of political power. In other words, in Schmitt’s view, the basis of the constitution is ‘a political decision concerning the type and form of its own being’ made by the people as a ‘political unity’ based on their own free will. This political will ‘remains alongside and above the constitution.’13 Schmitt also played off the people as an existential reality against merely liberal representation of voters in parliament. According to Mudde and Kaltwasser, populists critique elitist, judicial constitutionalism, and endorse the participation of ordinary citizens in constitutional politics.14 In a more recent work they argue that populism, by holding that nothing should constrain the ‘the will of the (pure) people’, is democratic15, but at odds with liberal democracy in rejecting the notion of pluralism.16 Although they admit that populism can develop into illiberal democracy, they also claim that it isn’t populism but rather nativism that is the basis of exclusion of others not included in the ‘real people.’17 This understanding of populism presupposes that democracy can be liberal or illiberal (electoral), the latter having a number of institutional deficits that hinder respect for the rule of law and exhibit weaknesses in terms of independent institutions seeking the protection of fundamental rights. 18 Carl Schmitt even went as far as to claim the incompatibility of liberalism and democracy, arguing that plebiscitary democracy based on the homogeneity of the nation is the only true form of democracy. Given that populism rejects the main tenets of constitutionalism, the term ‘populist constitutionalism’ seems to be an oxymoron. In my view, given that populist conceptions of the constitution reject the imposition of limits on the unity of power, adherence to the rule of law, and the protection of fundamental rights, i.e. the main components of constitutionalism, the term ‘populist constitutionalism’ seems to be an oxymoron. The same applies to ’authoritarian’ or ’illiberal’ constitutionalism. If the main characteristic of constitutionalism is the legally limited power of the government, neither autoritarian nor illiberal polities can fulfil the requirements of constitutionalism.23 As Mattias Kumm puts it, Carl Schmitt’s interpretation of democracy inspired by Rousseau and used by authotarian populist nationalists as ’illiberal democracy’ has become an anti-constitutional topos. Consequently, I equate constitutionalism with liberal democratic constitutionalism.24 This does not mean, however, that constitutions cannot be illiberal or authoritarian. Therefore it is legitimate to talk about constitutions in authoritarian regimes, as Tom Ginsburg and Alberto Simpler do in their book26, but I do not agree with the use of the term ’authoritarian constitutionalism’27 or ’constitutional authoritarianism.’28 Moreover, the constitutions in the Communist countries, both current theocratic and communitarian constitutions, are considered illiberal.29 Theocratic constitutions, in contrast to modern constitutionalism, do not reject secular authority.30 In the communitarian constitutions, like the ones in South-Korea, Singapore and Taiwan, the well-being of the nation, the community and society receive utilitarian priority rather than the individual freedom principle of liberalism. But in these illiberal polities, like in Hungary, there is no constitutionalism.